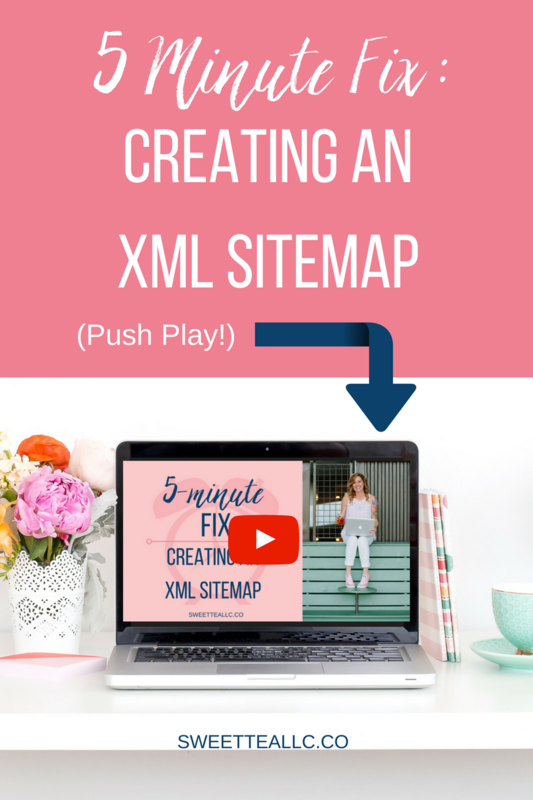 In this week’s 5 Minute Fix I'm going to show you how to create an XML sitemap and submit it to Google. An XML sitemap is what search bots will use to crawl and index your site with all of your pages and posts. If you're running self-hosted WordPress you should have the Yoast SEO plugin installed and activated. You want to make sure that you go to your Yoast SEO plugin in your sidebar and scroll down to XML sitemaps. You need to make sure that this functionality is enabled. After you have enabled your sitemap, you are going to click on the link that says “you can find your site map here”. This is going to pull up every site map that you have for your individual site, and this may be different from what you have, but you can see what each one is - this is for blog posts, pages, light box, easy index, testimonials, categories, and tags. What you want to do is submit each of these sitemaps to Google’s search console, and I will put the link to this in the notes for this video, but you're going to go to Google’s search console, and you're going to land on your dashboard here. If you don't have your site listed with Google’s search console, you'll simply go add your site. It's very easy to do. And then you'll go to your dashboard, you’ll click on “crawl” and “sitemaps”, and you can see I've got a few already here. In this 5 Minute Fix, you'll learn how to create an XML sitemap and submit it to Google Search Console. If you check the box you can resubmit those; if you've added or changed your categories recently you're going to want to refresh that. I have ‘category page’ and ‘post’, so let's see what we're missing. We’re missing ‘light box’, ‘easy index’, ‘testimonial’, and ‘post tag’. I'm not necessarily concerned with Google crawling my testimonials or my easy indexes or my light boxes, so I'm probably not going to add those but I definitely want to make sure they crawl all of my posts, all my pages, all of my categories, and all of my tags, so if I'm missing any of those I definitely want to go add them. It's really easy to do - you just click on “add/test sitemap” and then you just go paste that here. And you can delete the first part because it adds your URL in here for you. And you just click submit and refresh the page so now it has that sitemap down here.And we're going to go ahead since I just added that one, it tells you the last time they were processed, and if it was processed recently you don't have to resubmit it, but if it's been a few days and you've changed things since the last time it was processed, you just checked the box on any or all of these, and you click “resubmit” and it will resubmit that sitemap fresh to Google’s search console.